If you wondered what to see in Split Croatia in one day, there are enough interesting amenities that you can explore after you finished the viewing of Diocletian palace (as a “must see” starting point) other places include Cathedral of St Dominus, Marjan Forest Park, the ruins of the ancient city of Salona (Solin), Meštrović gallery, Archeological museum with with a collection of old findings from Aincent Greece, that came from the island of Vis that the greeks called Issa. There are plenty of things to do in Split… It all depends of the duration of your stay and the personal affinities and interest towards city landscapes, museums, ancient monuments and nearby cities. There is no lack of original restaurants with traditional food and wines. 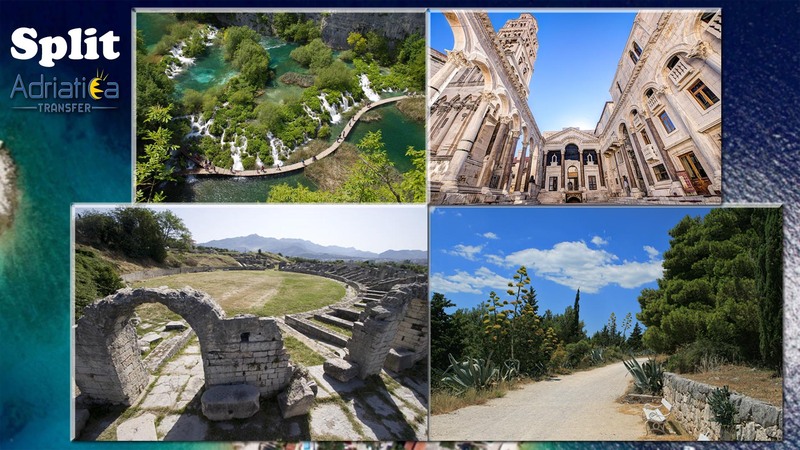 Your best option is to check Diocletian’s palace sightseeing tour so you will not miss anything and will be provided with accurate data from our professional multi language Split tourist guides. Split, a town on Croatia’s Dalmatian Coast, is known for its beaches and the fortress like complex at its center, Diocletian's Palace, erected by the Roman emperor in the 4th century. Once home to thousands, its sprawling remains include more than 200 buildings. Within its white stonewalls and under its courtyards are a cathedral and numerous shops, bars, cafes, hotels and houses. 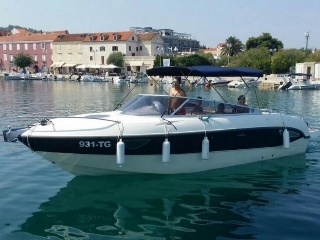 You can take many boat tours from Split to islands like Vis,Brac and Hvar or a boat transfer from Split to whichever location you desire in the Croatian riviera! 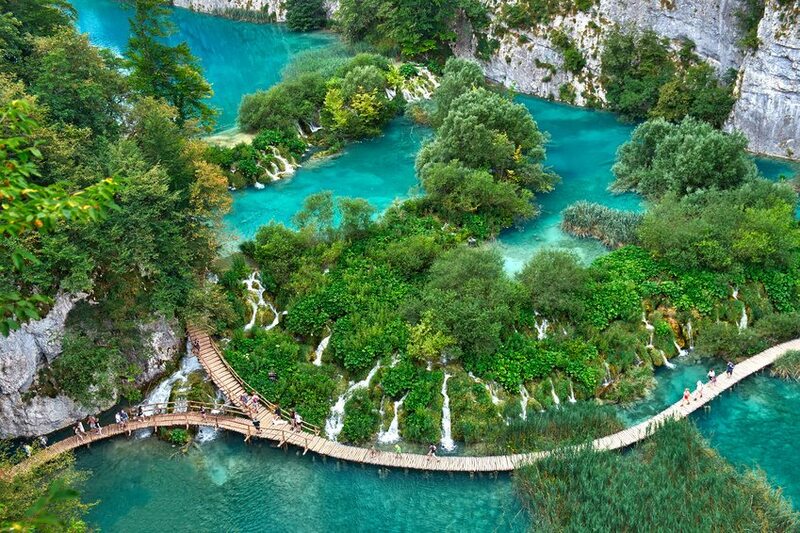 Plitvice lakes are one of the biggest Highlights of Croatia, it is truly a Croatia`s top natural attraction. In 1979 Unesco proclaimed Plitvice lakes a world heritage site. There is a total of 16 lakes that tumble into each other with series of waterfalls and cascades. 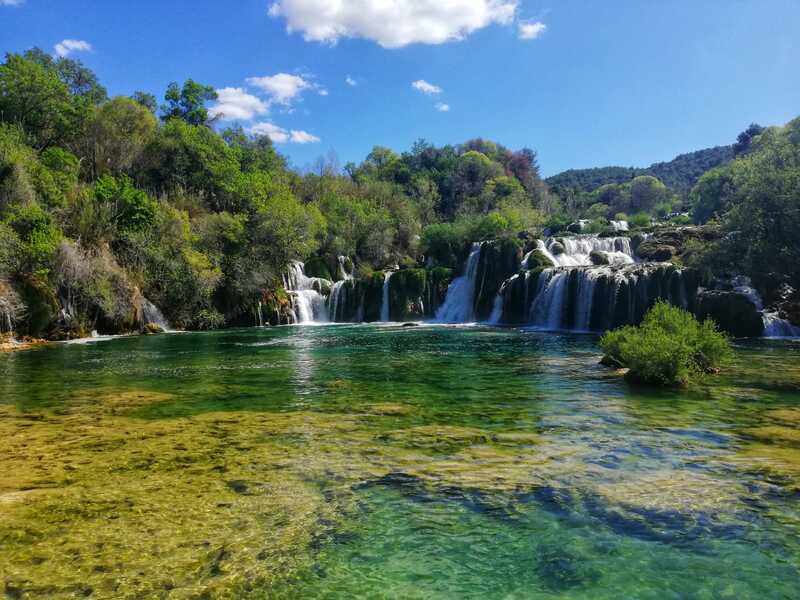 The Plitvice Lakes sightseeing tour will give you the opportunity to walk on footbridges and pathways that pass right thru the center of the lakes to truly experience the whole beauty of the lakes. Burovnik is one of the most known and famous tourist destinations in Croatia, its far southern region, neighboring with Montenegro. Beautiful old city with unique city walls, well preserved and due to its unique walls that were protecting the city from invasions in history, Dubrovnik was a set for a famous American TV series Game of Thrones, Ideal choice to spice up your Split area sightseeing with day trip to Dubrovnik for a unforgettable experience. Krka National Park tour is a river that stretches about 70 kilometers thru Knin all the way to Brištane, where the Krka national Park is situated, it is a series of 7 waterfalls which together make beautiful scenes that are definitely worth seeing when visiting Croatia, at the top of the river, before the waterfalls, there is a Krka Monestery, it is a unique combination of Mediterranean architecture combined with Byzantine style, the monastery was founded somewhere around 1340, by Jelena Šubić, she was the wife of a local Croatian Nobel and she was also the half sister of the Emperor Dušan of Serbia. During the war the monastery’s treasury manuscripts and paintings were moved to Belgrade for safekeeping, the monastery was protected by the UN during the war, it reopened back in 2001 and now has around 50 theology students. You can also find the “Mother of Mercy Franciscan Monastery” which was founded in the 14th Century by Augustinian hermits, it was expanded in 1445 due to Franciscans escaping the Ottoman invasion of Bosnia, later only in 1728 it was remodeled and a bell tower was added. Mostar is the largest city in Hercegovina but the fifth largest in the whole country of Bosnia and Herzegovina, with a pretty small but enchanting city center, the always crowded street is Kujundžiluk which is surrounded by many local sellers of trinkets and souvenirs, the reason why the street is always crowded is due to the fact that close to the street the most iconic part of the town is located, the Mostar Bridge, the name in Bosnian is “Stari most” which means “Old bridge”. 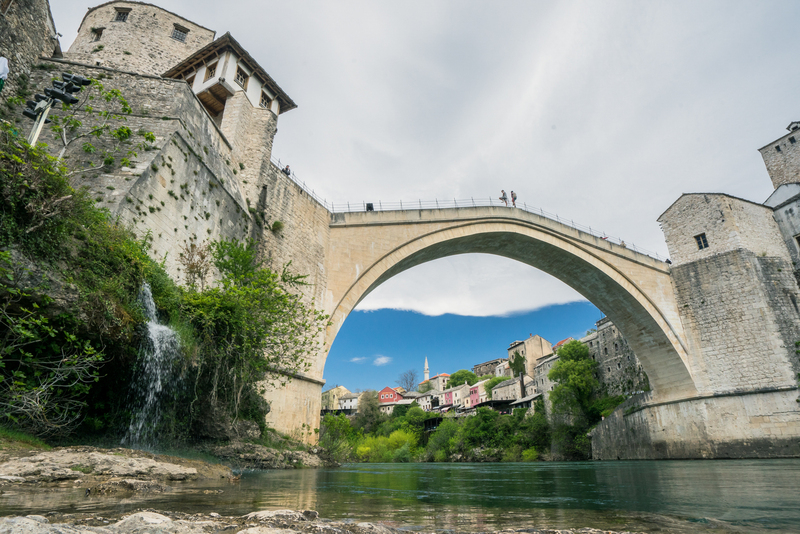 By the order of the Suleiman the Magnificent the bridge was built between 1557 and 1566 but the bridge was rebuilt again after 1990 because it was destroyed during the civil war in Bosnia, by a deliberate bombardment from a Croatian artillery attack. 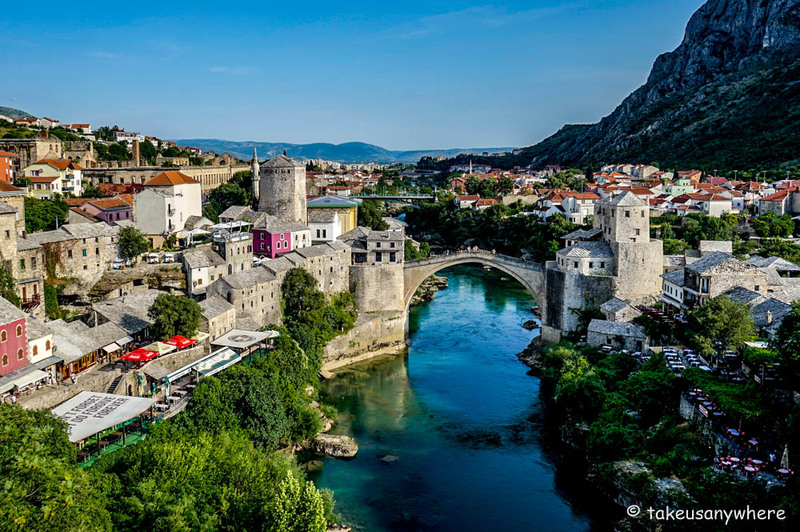 It reopened in 2004 and is now a UNESCO world heritage site, one other specific fact about the bridge is its divers, there are few divers who jump from the bridge in to the lake “Neretva” below, it is a dangerous act and not everyone is encouraged to jump. Koski Mehmed Pasha Mosque was built in 1618, you can climb to the top of the minaret but you will need to pay a entrance fee, because the view is beautiful, you are looking down on the Old bridge and one part of the city, it is worth paying the entrance fee if you want to take some nice photos. Other places you can visit in Mostar are “Kajtaz House” which was once a Harem for a Turkish judge during the Turkish invasion. Partisan Memorial Cemetery, which contains the graves of 810 Partisans from Mostar who lost their life’s fighting fascism during WWII , it was designed by leading Yugoslav era architect Bogdan Bogdanović. There is a little Square called “Španski Trg”, which was as most of Mostar bombed during the war, its still to this day has shell-pocked buildings and a few buildings remain in ruins, but most of the city is rebuilt, and some buildings like the High School that dates back to as long as 1902, was repainted and rebuilt. Mostar Peace bell tower is a very big bell tower which you can go to the top and see the view as well as of course, the bell its self, there is a lift that will take you to the top which will spare you half of the trip, it is a replacement for an 1866 basilica that was badly damaged during the war. Many other places like the Old bridge Museum, which displays and talks about the bridges context and construction. Trg Musala which was once the heart of the Austro Hungarian Mostar, a unique mix of architectural styles thru history surround the square but close to it, as a painful reminder of the horrifying bombardment during the 90`s stands the once highly prestigious hotel Neretva which is completely in ruin due to damage inflicted from the war. Many more little museums, towers, mosques and a war photo exhibitions. We will be happy to see you join on us as we explore these beautiful locations thru the Croatian riviera!